The second quarter of 2013 was a rough one on Wall Street for retailers. Geopolitical concerns, a wishy-washy economic environment left many retail chains with a depressing show-and-tell of disappointing sales figures, uninspiring guidance for future quarters, and a general lack of investor confidence. However, not all of the stocks that were battered deserved the haircuts they got. For bargain hunters, that means an opportunity to buy otherwise high-quality companies -- strong merchandisers with long-term potential -- that are simply experiencing short-term weakness brought on by macro, non-company-specific factors. Here are three retail businesses whose stocks you should consider. It's no secret that big-box stores have had their business models upended by disruptive technology and smaller, niche-focused competitors stealing market share. Investing in one today takes a certain kind of attitude -- one focused on minimizing the downside rather than forecasting for big-time growth. One well-known big-box player -- Staples (SPLS) -- has seen its brick-and-mortar business erode along with margins and, naturally, investor sentiment. While there is little reason to believe that the stores will miraculously return to their former prowess, the company does hold some very compelling prospects for future growth. Management has a multipronged approach to boosting sales. The first tactic involves the company's Web presence. This may come as a shock to readers, but Staples is the second-largest online retailer in the world, trailing only Amazon.com (AMZN), the very company that put the squeeze on Staples' original business model. 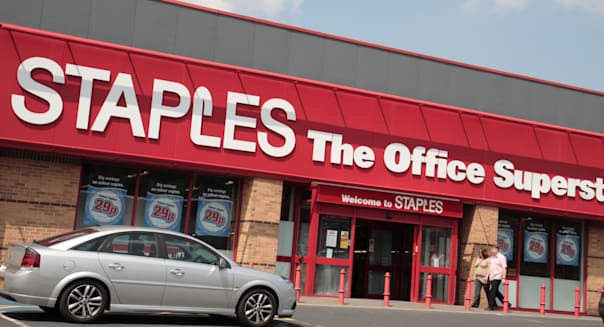 In fact, today Staples is more of an online business than a physical one. In the first quarter alone, the company added 90,000 SKUs to its Web store, which management claims boosted sales by $1 million per week. %VIRTUAL-article-sponsoredlinks%The company also has a growth platform in Europe. Management doesn't expect much in the way of top-line sales growth in the coming quarters from its European presence, but margins should improve, which will add to the company's free cash flow generation. Earlier this year, same-store sales at European locations reached a three-year high. Though the stock is up more than 30 percent since the beginning of this year, Staples took a dive at the end of August when the company reported softer-than-expected sales and a tepid outlook. After hovering around $17 per share for some time, the stock sank almost 20 percent to under $14. It has since regained some of that ground, but the market clearly finds this business to be troubled. That trouble may be overblown, as management's cost-cutting efforts coupled with its focus online and European growth should create a leaner, more efficient business. Not to mention, Staples is expected to earn $900 million in free cash flow this year -- not too shabby for a company with a market cap under $10 billion. Spun off in the fall of last year, Sears Hometown and Outlets (SHOS) debuted to yawns from Wall Street. Analyst coverage is minimal, and investors seem to be spooked by a business with "Sears" in the name. The thing is, Sears Hometown and Outlets is a better business than its former parent. Its Hometown hardware stores are heavily franchised -- which helps gross margins over time. And the Outlet stores, -- fewer than 200 in number but growing -- fill a certain niche, selling warehouse-priced appliances and mattresses and more. The sales figures on the latter segment remain strong, despite an overall soft quarter in the recently ended period. Yet, in just three months, Sears Hometown and Outlets has seen its shares lose nearly 30 percent of their value -- erasing all but 3 percent of its gains since the spinoff. Much of the bad news pushing the stock lower has nothing to do with the fundamentals. Instead, it reflects non-operating events. For one thing, the separation from Sears Holdings (SHLD) is still costing the company plenty of money -- but that will soon end as the spinoff recedes in the rearview mirror. Also, Sears CEO and hedge fund guru Eddie Lampert distributed shares of SHOS to his investors, who likely sold off the stock: For weeks this summer, share volume was much higher than usual and the transactions were hurting the stock price. Of course, it was a bad quarter for retail as a whole, and the company was not entirely immune. But the good news for would-be investors is that Sears Hometown and Outlets has its stock back down to its market entrance levels, giving investors an opportunity to ride the business back up again. Among the various demographics a business can target, teenagers may be one of the most difficult. Trends, as any parent knows, fall in and out of favor incredibly fast, which can prove a monumental challenge for even the most skilled merchandiser. Aeropostale's (ARO) entire business model is based on predicting the whims of that arbitrarily-behaving group of humans, and lately its crystal ball has been a little out of focus. Same-store sales took a double-digit dive, along with a drop in top-line sales and a $0.34-per-share loss for the quarter. The company is increasing the number of stores it's closing, bracing investors for more losses ahead. It's also attempting to double down on innovating and streamlining its business -- fewer brick-and-mortar stores, a greater Web presence, and a better merchandise mix. Things won't be pretty for Aeropostale investors in the short term. But with management slicing costs -- a picking off of the proverbial low-hanging fruit -- getting smaller may be the road to getting bigger, at least in terms of stock price. Overall, this one is for the more advanced, deep-value investors. The company may very well see a turnaround over the next one to three years, and if it does, buying in at today's valuation would provide a handsome return on investment. However, this is also a business that has struggled internally -- and not just from a poor retail environment. If management is unable to get the gears grinding in the right direction, the stock could fall further still. The good thing about retail stocks is that investors have frequent access to detailed information about the companies' performance -- more so than with most other industries. Macro factors weigh heavily on these businesses, and sometimes the down times provide opportunities to buy a piece of the business at a discounted price. The key, as mentioned, is choosing the retailer that performs over the long run. Don't buy hype, and choose brands you know will endure. Motley Fool contributor Michael Lewis owns shares of Sears Hometown and Outlets. The Motley Fool recommends Amazon.com. The Motley Fool owns shares of Amazon.com, Sears Hometown and Outlet Stores, and Staples. Try any of our newsletter services free for 30 days.